This past Sunday I started off the morning with my cousin Jenn and friend Hillary at Bamboozle’s Sunday Salutation Yoga. It is a free class offered every Sunday morning – it’s only been going on for a few weeks now, but I’d highly recommend checking it out! We set up our mats right in front of the Tea Lounge. It was the perfect way to start off the morning. Plus someone outside had adorable corgi puppies! Afterwards, Lynn at Bamboozle gave us complimentary tea and brunch samples – and I cooled off with my favorite coconut milk drink with chia seeds. If you want to participate, check out their facebook page for more info. I was excited to have Sunday off work because Green Bench Brewing hosted a Brew Brunch! From the flyer, I wasn’t quite sure what to expect, but I knew I wanted to check it out. So we headed to St. Pete to see what it was about. It was PACKED! Every time I’ve been to Green Bench, it’s been a weekday, so I’m used to there being about a dozen people there. There were hundreds of people – and their kids and dogs. (We saw ANOTHER corgi!) The photo below was from Local Buds: Artisan Collective’s facebook page – it shows way better than my pictures just how many people were there. We grabbed a saved a spot at a bench inside while some of the other girls waited in line for the food. The tables were covered in beautiful succulent arrangements by O’Berry’s Succulents. I ordered a flight of beers while we waited. I especially liked their featured tap called Sometimes You Don’t – a toasted coconut, vanilla, and chocolate milk stout. Since Lance had to work, I filled up a growler of the Surrealist IPA to bring home (he likes it, but I’m not a big fan of sour beers). Apparently Squeeze Juice Works was serving collaborative beer mimosas, but I didn’t realize that until after I already ordered my flight! The brunch was served by the food truck The Twisted Iron, which had all sorts of fancy waffle varieties. Some were sweet like the Elvis waffle topped with peanut butter, bacon, and bananas; others were savory like the Philly-style steak and cheese waffle with sautéed mushrooms and onions. It took over an hour to get food since it was so crowded! I tried the chicken and waffles, served with honey mustard and maple syrup. Unfortunately, by the time we got our food, they had run out of the fancy syrup. So we ended up with Smuckers instead. Guess we need to get there earlier next time. The double stout honey mustard was great – it was made by The Urban Canning Company (I had just bought some of their Pear Dark Chocolate Cinnamon Jam from Duckweed the other day). Afterwards we stuck around for some fun playing giant jenga out on their patio. 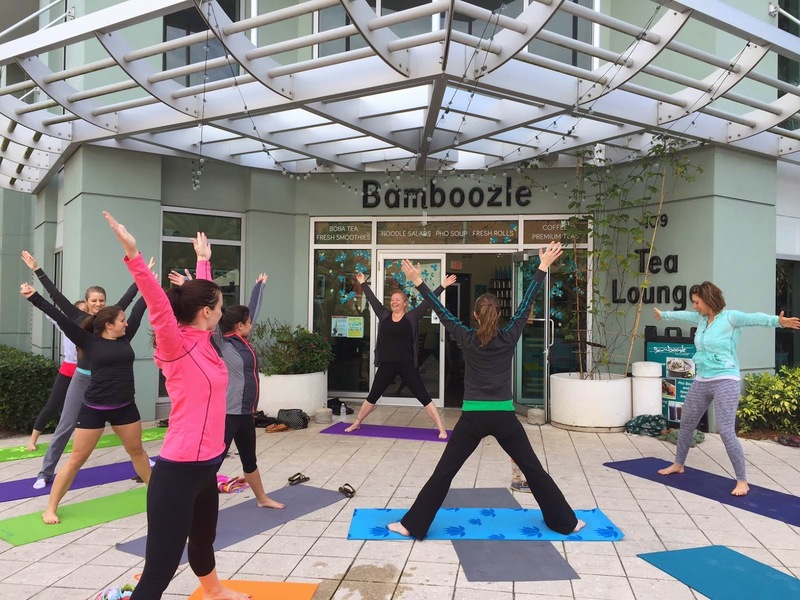 Bamboozle Tea Lounge is located at 109 N 12th St #101, Tampa, FL 33602 and open from 11:30am – 9pm Mondays through Saturdays, and 11am – 4pm for brunch on Sundays. 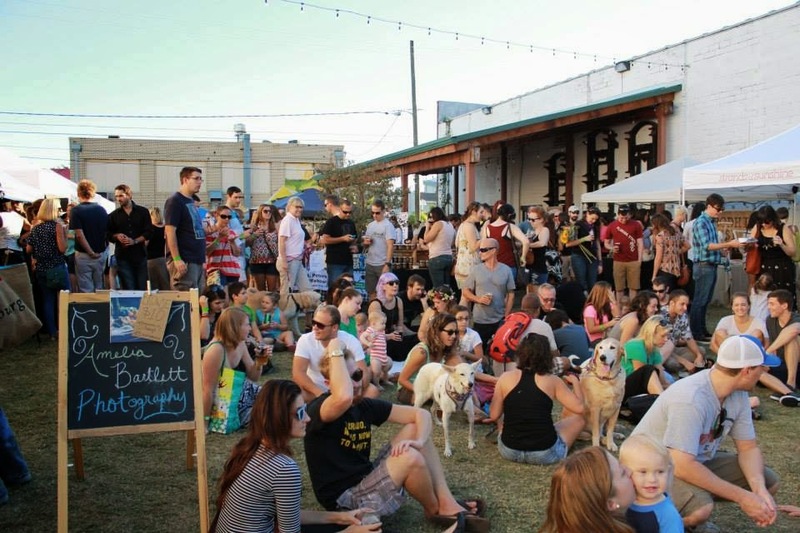 Green Bench Brewing is located at 1133 Baum Avenue North, St. Petersburg, FL 33705 and is open 2pm – 10pm Tuesday – Thursday, 2pm – 12am Friday, 12pm – 12am Saturday, and 12pm – 10pm on Sunday. They are closed Mondays. I'm Amanda from Tampa, Florida. This is my blog about recipes, restaurants, and all things food.